A meeting scheduled between National Education, Health and Allied Workers’ Union (Nehawu) and the Minister of Higher Education, Naledi Pandor has failed. It was to address issues of disgruntled workers calling for the Department’s Director General Gwebinkundla Fellix Qonde to step down. The union feels that he has failed its workers. Following the collapse of this meeting, Nehawu has called on all its members to stand united on a national strike. “So the meeting collapsed because of the refusal and demand made by Nehawu to excuse the DG (Director General) who is really an issue that has caused the strike. The minister refused to accept on the basis that we couldn’t find each other,” says Nehawu Secretary General Zola Saphetha. Various stakeholders sat in the meeting including Sasco which highlighted the burning issues facing students especially at TVET colleges. “We are saying the TVET colleges must not threaten student leaders when voicing issues because they affect students daily. It can’t be that there are colleges without computer labs or libraries and yet we talk of a South Africa going into the 4th industrial revolution,” says Sasco president Avela Mjabana. 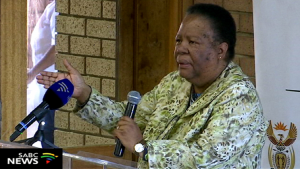 Minister Pandor has expressed dismay at Nehawu’s stance to exclude her Director General from the meeting. In a written statement she said she was committed to finding solutions for issues raised by Nehawu. But the Union responded saying it would be prepared to have a follow-up meeting only if the Director General is not present. The post Meeting between Nehawu, Pandor collapses appeared first on SABC News – Breaking news, special reports, world, business, sport coverage of all South African current events. Africa's news leader..